I’d been ripping through the countryside at 110kph for about six hours when I spotted Old Mate striding, eyes down, along the verge. Like the hundred cars before me, I noticed his steady gate, his hessian bags and the personality evident in his hat and rolled right by. I’d travelled five k’s before the feeling took hold – Old Mate had a story to tell. I hacked a U-turn, rode a kilometre past and parked the bike in a siding. I shed my helmet and jacket and picked my way back along the verge towards him. Road trains rattled the scrawny gums with their air wash. I could hear the drivers hesitate on the accelerator as Old Mate came into view around the sweeping bend ahead. A Land Cruiser tooted a wave. On the ground at my feet, I spotted a bearded dragon. The lizard was frozen and almost invisible on the leaf litter. I took a photo and crouched a little closer, resting my hand on the grey bark and leaves in front of it. The lizard didn’t move so I inched closer and tickled it under the chin. It climbed on my fingers and I stood cautiously. The lizard hung there and let me take a few more pictures, unblinking and cool. I wondered if it was injured or ‘special needs’, but when I’d marvelled and had my photographic fill, I lowered it to the ground and it shot off into the undergrowth like I’d thrown it. He jutted his chin and I slid into step beside him. We shook hands and he told me his name was John. 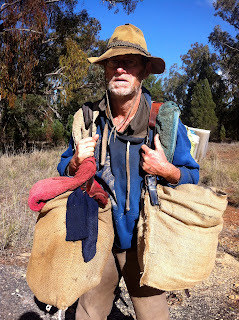 John had been walking for thirty-five years – Victoria to Queensland and back again, every year. His wife walked with him for the first couple of years. He’d been a banker back then, but realised the job wasn’t for him. The first time he walked, it was an action to clear his head and give him the chance to think about what he wanted to do with the rest of his life. He didn’t have any revelations that year, so he just kept walking, Forest Gump style. He’s still walking. He makes enough money for the food he needs selling and trading the things he finds on the roadside. In the eighties it was spanners, now he finds a little change and collects aluminium cans when he’s approaching a town. Never takes a lift and has never been on the dole. He doesn’t think he’d qualify. Doesn’t have an address. Doesn’t have a plastic card. Was once a banker now doesn’t have a bank account. Just think about that for a minute, because I had to. Doesn’t. Have. A. Bank. Account. That’s probably against the law somewhere. In a first world country like Australia, it’s like cashing out before the game begins and from at least one angle, a profoundly liberating idea. You don’t need a mortgage or credit card if your home is a sheet of plastic and a tarp, pitched in the shade of a new coolabah every night. If your existence is supremely minimal in a rich nation, you can live off the the side of the road. For a minute, I wondered if he’d been injured or was ‘special needs’, but when I shook his hand again and he bade me happy riding, I realised he’d found something precious on the side of the road – a simple life that pleases him to the core.